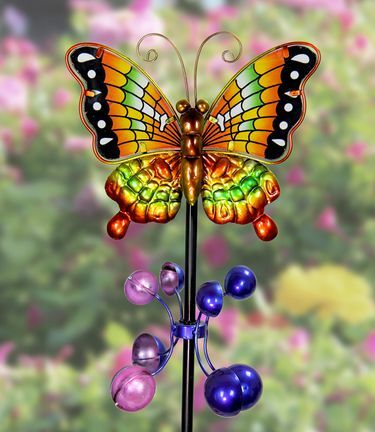 Add a burst of color and motion to your garden with a beautifully hand painted Metal Butterfly Plant Stake with spinning details. A gentle breeze begins the twirling motion, making this stake a vibrant addition to any garden! Made of durable UV treated metal to help resist fading in the sun. A great butterfly garden gift for Spring, Summer and beyond! Size: 8.5" x 5.25" x 38" H.